I am an introvert. I grew up shy and spent most of my life keeping things to myself, my opinions, my frustrations, and my appreciation. A few years ago, I purchased a dress for the first time in over a decade. The first time I wore that dress in public I received three compliments from strangers. It stuck with me the whole day. The feeling of being seen and appreciated made the whole day better. It also made me bolder, I started telling complete strangers when I liked their hair, hat, passion, effort. I got a lift every time I spread appreciation around because I could see on the faces of these strangers the very same glow I remember feeling. It is addictive. I get just as big a charge out of expressing my admiration and appreciation to people as they do receiving it. I am glad I got over this particular thread of introversion. It is good for me and good for our world. 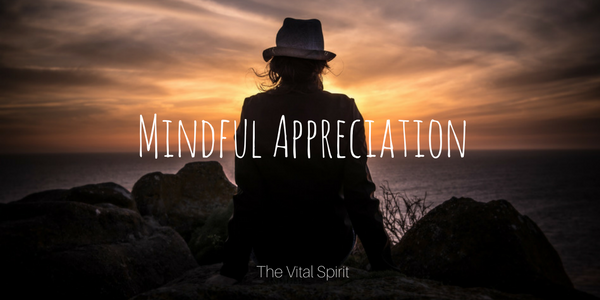 Mindful appreciation changes the giver and the receiver. The more I seek out opportunities to appreciate, the better I feel about my life and the world in general. Appreciation is definitely a butterfly effect, it is hard to track how far and how wide a simple act of appreciation can spread. I appreciate each and every one of you who have taken the time out of your busy day to read my ponderings. My sincerest thanks.